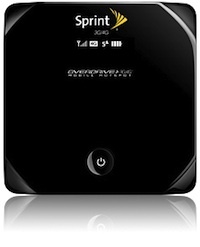 The Sierra Wireless Overdrive 3G/4G Mobile Hotspot from Sprint will be piloted in Hawaii's Myron B. Thompson Academy. In a one-year pilot program, some middle school students in Hawaii will receive mobile devices that allow them to carry WiFi hotspots with them wherever they go. Eighth graders at Hawaii's Myron B. Thompson Academy will receive Sierra Wireless devices (called Overdrive 3G/4G Mobile Hotspots) for the 2010-2011 school year. The platform-independent devices operate on Sprint's 3G and mobile broadband networks and act as a bridge for devices like laptops, tablets, and media players to connect to the Internet via standard WiFi. (The WiFi range is up to 150 feet, according to Sprint.) The devices also include shared network storage for up to five devices via MicroSD slot. Sprint said connection speeds will range from 600 Kbps to 1.7 Mbps for students accessing the Internet via 3G and an average of 3 Mbps to 6 Mbps (peak download speeds of 10 Mbps) for students who are within one of Sprint's WiMAX coverage areas on the island of Oahu. Myron B. Thompson Academy is an online public charter school serving Hawaiian students in kindergarten through 12th grade. The pilot program is designed to allow students to access online educational materials from anywhere. "The goal of this program is to provide teachers with new ways to capture student work, and improve student achievement through the use of mobile technologies," said Jacey Waterhouse, an English teacher at Myron B. Thompson Academy, in a statement released this week. "The greater level of accessibility to course content and materials from nearly any location will encourage students to realize learning happens everywhere and at anytime, and is not confined to the classroom." A part of Hawaii's E-School, operated by the Hawaii Department of Education's Advanced Technology Research Branch, the Myron B. Thompson Academy serves students on the islands of Hawaii, Kauai, Molokai, Maui, and Oahu.